i have seen several ideas floating around this year. it seems the theme of thanksgiving has been permeating the thoughts and souls of many, many people. i, too, have decided to cultivate a thankful heart, both in myself and in my family. 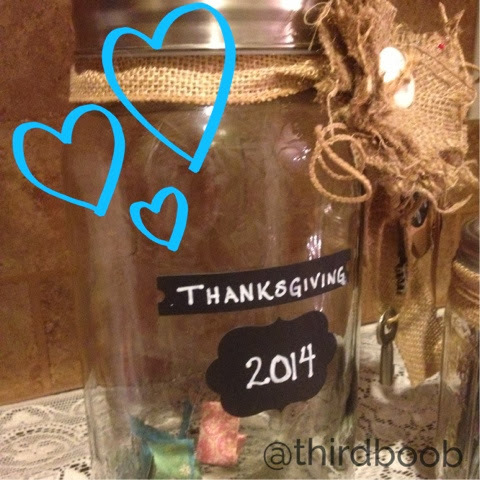 we have added our own thanksgiving jar to our family traditions we plan to keep from year to year. 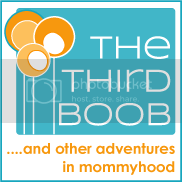 there are many versions of this. some people have started a thanksgiving journal. 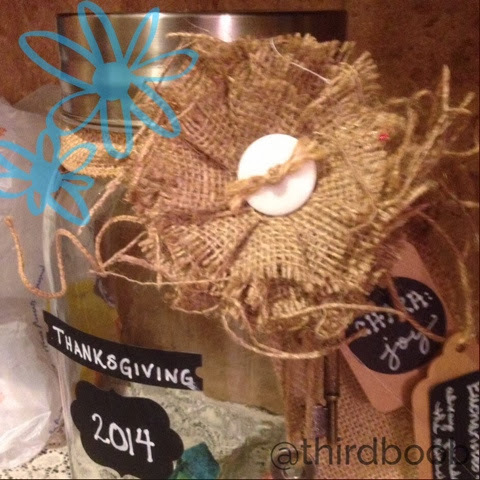 others are incorporating writing spaces in their homes where they can post their daily declarations of thankfulness. i loved this idea. as my family finds something they are thankful for, they write it on a slip of paper and put it in the jar. at the end of 2014, we'll take the papers out and look back on all the things we've been thankful for over the last year. the art of finding things to be thankful for even on the worst days is revolutionizing our minds and hearts as we approach this new year. 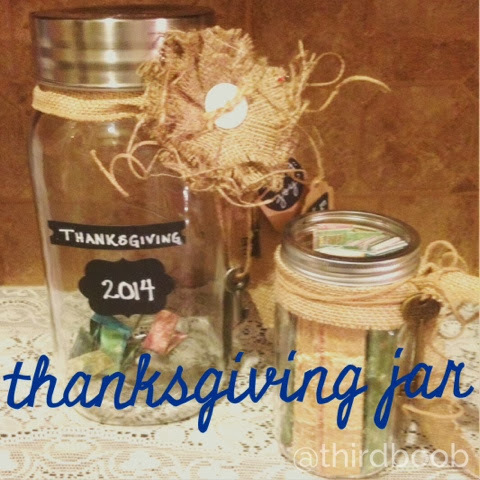 if a jar doesn't sound appealing to you, find another way to chronicle the things you are thankful for. i guarantee, it will make your life better. i started with an extra large bell jar. i purchased some chalk stickers and some ribbon and decorated the jar in a way that would make me happy as it stares at me for the next year (and maybe the years after as well). i know myself (and my family members). if the task of writing becomes too difficult, the moments of thankfulness will never make it onto a piece of paper. so, i prepared a second jar. 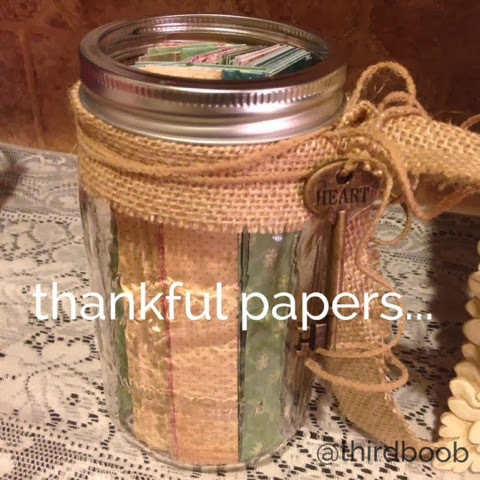 this jar is full of pre-cut papers and a couple of little sharpie markers (my personal favorite). i left the lid off of the jar for easy access. 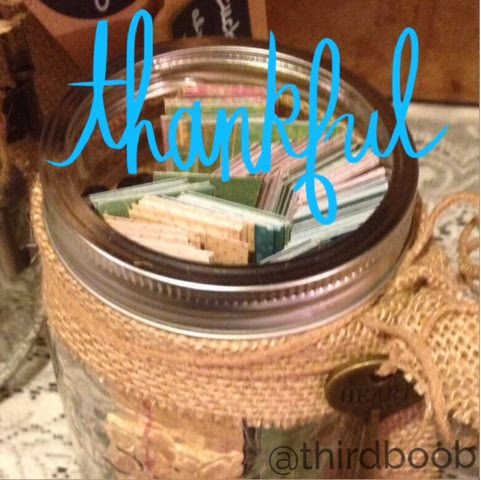 now any of my family members can find a moment of thankfulness and easily write it down to put in our jar. what about you? do you have ways to cultivate a thankful heart in your families and in yourself? what an amazing transformation happens when we first strive, even on the toughest days, to be thankful.